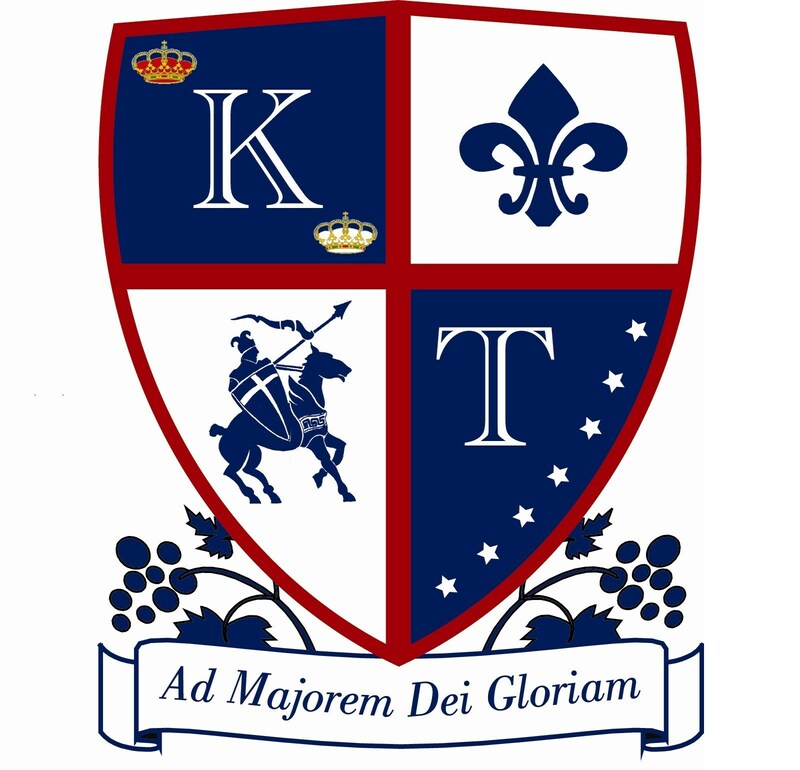 The “K” stands for Kolbe Academy, our grammar school, named after St. Maximilian Kolbe, a Polish priest who suffered martyrdom in Auschwitz. The two crowns represent the crowns Our Lady offered young Maximilian—red for martyrdom and white for purity. The “T” stands for Trinity Prep, our high school. As Christians, the Trinity is the absolute center of our existence—from the Trinity stems all that was, is and shall be. The seven stars are representative of the Blessed Mother and a powerful symbol from Revelation. The fleur-de-lis, a stylized lily, is an ancient representation of the Blessed Mother as the Lily of the Trinity. The lily is a symbol of virginity and purity as well. The Crusader is the school’s mascot. Crusaders were valiant soldiers who fought to restore the holy places of Christianity. More generally, a crusader is an individual devoted to the vigorous defense or advancement of an idea or cause—something we desire all of our students to be. The grapes represent Jesus Christ as the Vine, with us as the branches, God’s good bounty in providing for all of us, and the beautiful Napa Valley in which we are located. Finally, our motto is Ad Majorem Dei Gloriam, For the Greater Glory of God. This was the motto St. Ignatius of Loyola selected for his religious order. We chose this motto to remind us of why we should do all we do.